Khazrak is a cunning foe. More than a mere brutal Beastlord, he is bestowed with an intellect far superior to that of his peers. The One-Eye has a deep understanding of his followers, able to channel the unruly nature of the herd and corral his Gors by harnessing their wild nature. 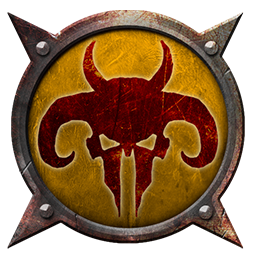 Not every true-horn is worthy of Khazrak's retinue; inferior tribes will come, Gors from across the Drakwald, drawn by the One-Eye's dark reputation and hoping to share in his despicable spoils. But Khazrak's success means he can afford to be choosy, and so only those Cloven Ones he deems worthy are offered a place by his side. Those that are turned down may well be sent on their way unmolested, others that Khazrak deems as a threat - perhaps bitter at their rejection - will not leave the immediate area alive. With the One-Eye able to be selective, Khazrak retains a fearsome grip upon his army - a wild force that enacts his cunning and effective plans with murderous efficiency. No one is spared during Khazrak's attacks, his superbly-trained Warhounds easily chasing down the few who manage to escape the warherd's trap.